Energy prices to soar by £400 in July as deals end – are YOU on one of these tariffs? Households could be hit with the whopping sum of £399 if they don’t remember to switch to another deal this summer. Fifty deals are set to end this summer compared to 33 in the same period last year. A number of popular deals from eight well known suppliers including EDF and Npower are set to end this month. This means families on these tariffs risk being automatically shifted onto a much pricier tariff. There are fourteen of these fixed deals ending. USwitch claim households could see a bill hike of up to £399 – a whopping 51 per cent – if they roll over to an expensive standard variable tariff. The company is urging consumers not to get caught out this summer. There are more fixed energy plans ending this summer than ever before according to uSwitch.com. 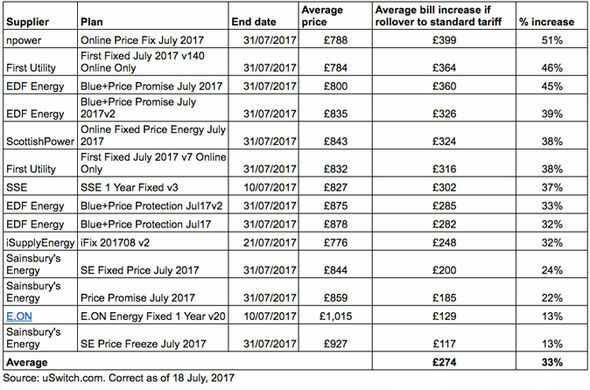 The average price increase for customers whose deals end in July is £274 per year, but some customers risk price hikes of up to £399. If they take no action, the customers facing the biggest hikes are those with npower (£399), First Utility (£364) and EDF Energy (£360). Ofgem’s rules allow customers to switch suppliers without paying exit fees from 42 days before their plan end date, so consumers are free to shop around without being penalised. Claire Osborne, uSwitch energy expert, says: “But with so many bills set to rocket this month, it’s vital to act now to avoid being rolled onto sky-high tariffs. Switching tariff is incredibly easy and is definitely worth ten minutes online, on the phone or on an app. Energy bills are costing the majority of British customers much more than necessary, as providers keep them on the most expensive tariff without informing them cheaper options are available. Currently, 17 million Britons are on the most expensive standard variable tariffs (SVTs) – dubbed a ‘rip off’ tariff by consumers. The independent think tank says that this sector already represents two to three percent of the UK’s GDP, and over 55 percent of trade in low carbon technology is with the EU. Negotiating Brexit, from think tank Green Alliance, highlights Brexit risks and proposes establishing a “Paris co-operation track,” using the Paris Agreement on climate change, an international mechanism ratified independently by both the EU and the UK, as the basis for future collaboration with the EU on climate and energy. • Electricity interconnection with the EU which meets seven per cent of UK’s electricity needs and keeps consumer energy bills down. National Grid’s “two degrees” scenario for UK electricity sees interconnectors providing 17 percent of UK peak demand by 2023. A doubling of existing interconnection could save up to £1 billion a year in reduced wholesale prices by 2020, but leaving the EU’s internal energy market would put this at risk. • Northern Ireland’s energy integration with the Republic of Ireland. If the UK leaves the internal energy market, it will disrupt the £6 billion (US$7.87 billion) Irish energy market. • Favorable finance terms from the European Investment Bank. Current loans from the EIB are worth £8 billion (US$10.5 billion), more than double the finance previously available from the Green Investment Bank for UK energy infrastructure over the past five years. This favorable finance has underpinned the success of the UK offshore wind and electric vehicle sectors. • Maintaining product standards and, in particular, vehicle standards which UK car manufacturers must comply with, as they export 80 percent of their vehicles, half of EU consumers. Divergence in a vehicle and other product standards would undermine UK exporters and risks turning the UK into a dumping ground for inefficient and shoddy products that aren’t fit to be sold in the EU. The study identifies several actions for the UK including to reconsider the hard line on the role of the European Court of Justice (ECJ), which governs the shared energy and climate rules across the EU and countries in the wider Energy Community. “The UK’s concerns about the ECJ should not lead us to forego the benefits of high levels of cooperation: greater energy security and faster and cheaper decarbonization. Several options are available to address potential concerns over the role of the ECJ,” says the Green Alliance. It suggests that an “association agreement” with the EU is a potential alternative, which would minimize the ECJ’s role and could achieve the necessary outcomes. It also wants to retain access to the internal energy market for electricity and gas to maintain barrier-free trade. The internal energy market and its rules and principles have served British interests well, according to the think tank, and Britain should negotiate continued participation in the market and the technical bodies proposing the rules. The Green Alliance also urges the UK to stay aligned with EU product standards and environmental principles as a significant divergence from these could undermine UK competitiveness and the ability to trade in low carbon goods and services, as well as weakening health and environmental safeguards. “Sustained cooperation will mean that the UK can continue to stand with the EU at the forefront of international leadership on climate. It will also maximize the benefits of low carbon trade with Europe and support the shared vision of long term energy security. Not least, it will secure clean and cheap energy for UK consumers,” says Chaitanya Kumar, Green Alliance’s senior policy adviser on low carbon energy, and author of the analysis. National Grid has welcomed the plan to make electric or zero-emission cars and vans account for all new sales from 2040, but said the government and industry now faced big decisions on how the extra power was provided and demand for it was managed. The grid recently warned that, by 2030, electric cars could require 3.5-8GW of additional capacity, on top of the current peak demand of 60GW. By comparison, the nuclear power station being built at Hinkley Point in Somerset will add 3.2GW of capacity to the system. By the middle of the century, when it is assumed almost all cars will be electric, that extra peak demand could be up to 18GW. The lowest estimates of extra demand assume that drivers charge their cars at off-peak times. Smart meters and time-of-day tariffs could incentivise owners to charge when wind and solar power are plentiful and electricity is cheaper. Energy networks could also manage demand via automatic time-shift charging, whereby a car plugged in at home at 6pm is not actually charged until the early hours of the morning, when demand is low. Ministers have already urged drivers to think carefully and avoid placing extra pressure on the grid. Regardless of how sensibly the extra demand is spread across the day, electric cars will require investment in new power generation. The energy analyst Wood Mackenzie estimates that if one in three cars sold in 2035 is fully electric, the vehicles would collectively account for 3% of the UK’s total electricity demand. Building 400,000 charging points for them all would cost £30bn, the group has said. National Grid said the extra power would be generated from gas, windfarms, imports and nuclear reactors – not from coal, which is scheduled to disappear from the UK’s power mix by 2025 at the latest. And the switch to electric vehicles could even provide an eventual boost to the grid. The government recently announced £20m of funding to support research on vehicle-to-grid technology, where the grid could call on the power stored in the cars’ batteries to help cope with fluctuations from intermittent wind and solar farms. Batteries and renewable power sources are on the verge of bringing about an “epochal transformation” of the UK that could make energy clean, abundant and very cheap, according to a cabinet minister. As the government unveiled plans for a more flexible energy system and £246m of funding for battery research, Greg Clark told the Guardian that a smarter grid would “radically” bring down bills. “Energy, for the last 100 years, for good reasons, we’ve rationed the consumption of [because] it’s been very expensive and environmentally-damaging to consume fossil fuels. [But] given the possibilities we are on the cusp of at the moment, we might move to a world where energy is clean and abundant,” said the business secretary. “If only we can capture it [power from the sun and wind] then we can go from energy being a worrying cost to people, to being, if not free, then very cheap,” Clark said, speaking in Birmingham on Monday as he put energy at the centre of the government’s industrial strategy. But the variable nature of wind and solar power generation means that local energy networks and the National Grid need more flexibility to cope with those fluctuations. Batteries, and the ability for energy firms to automatically reduce electricity demand from willing businesses and households, are at the heart of a plan published by government and Ofgem. Ofgem said using technology to flatten out peak demand and avoiding the cost for reinforcements to energy networks would save consumers £17bn-£40bn by 2050. The regulator said that the 29 changes to energy regulation announced on Monday, which will come in over the next 18 months, would also encourage new, tech-savvy entrants into the energy market. Andrew Burgess, an associate partner at Ofgem, pointed to emerging smart appliances that could automatically turn down electricity use at peak times, and make it possible for companies to aggregate the solar power from householders’ rooftops and sell it to local power grids when needed. The changes should also make it easier for companies to aggregate and trade services from people who have fitted solar panels or batteries at home – selling households’ electricity to power grids at times of need. “For individual consumers, I think the opportunities are for businesses coming in, for the Amazons and Netflixes of the world coming into a traditional sector and offering different ways for consumers to engage,” Burgess said. The smart grid plans came as ministers launched the Faraday Challenge, pledging £246m of funding for battery research, £45m of which will be used to create a national battery institute,which will be a virtual grouping of universities across the UK. “Its work will quite literally power the automotive and energy revolution, where the UK is already leading the world,” said Clark. He added that the national battery centre would be a fitting way to mark the 150th anniversary of the death of Michael Faraday, the scientist who undertook groundbreaking work on electricity. Nissan, which makes the batteries for its leaf electric car in Sunderland, said the government plans, combined with having more cars plugged into the grid, would have “a fundamental impact on the shift from fossil fuels to renewables”. But some industry watchers said that while the changes were necessary, they risked creating a two-tier energy system of haves and have-nots, if adequate protections were not put in place. Jon Ferris of Utilitywise said: “Today’s announcements will be transformational for the energy sector, but are not a panacea for the challenges of maximising energy productivity and accommodating increasing renewable generation. However, Clark was adamant that the plans would reduce rather than increase inequality in the energy market. “[There] should not be a class of people who are excluded from these possibilities on the way to a big, abundant future,” he said, adding he would make it clear to energy suppliers that they had an obligation to help vulnerable customers access new technology. Decarbonising the UK’s gas networks could play an important role in achieving the targets set out in the Paris Agreement. That’s according to a new report from Imperial College London’s Sustainable Gas Institute (SGI), which says the existing natural gas system will need to be replaced with a greener solution if the UK is to effectively decarbonise. Although this role could be taken over by electricity storage, the SGI suggests green gas storage would likely prove a better option. They believe this would have the advantage of repurposing the valuable assets such as gas pipes that are already in place and would match up with the preferences of consumers, who generally like using gas appliances. The group adds technical issues need to be explored before the costs of such a system conversion could be accurately calculated but claims low carbon gas can be relatively easily and inexpensively stored. This gives it the benefit of increased flexibility over electric alternatives which the SGI says are more technically challenging. The researchers estimate biomethane might cost around 8.1 pence per kilowatt hour (p/kWh) on average, with hydrogen predicted to cost slightly more at an average of 9.3p/kWh. To compare this to current energy systems, in 2015 the equivalent EU price for electricity was 17p/kWh and the average EU natural gas retail price was 5.4 p/kWh. Dr Paul Balcombe, a Co-Author in the SGI, said: “The timeframe for the potential conversion of the gas network could be in the late 2020s. Companies that run Britain’s electricity and gas networks, including National Grid, are making “eye-watering” profits at the expense of households, according to a well-known consumer group. Citizens Advice believes £7.5bn in “unjustified” profits should be returned to consumers who pay for network costs via their electricity and gas bills, although its figures have been contested by the energy industry and regulator. Ownership of electricity and gas networks came under the spotlight in the run-up to June’s general election, after the Labour party said in its manifesto it would bring both national and regional grid infrastructure to back into public ownership over time. Electricity sector privatisation began in 1990 and the gas industry was privatised in 1986. Energy network companies — which own and operate the cables and wires that help deliver electricity and gas to homes and businesses — are in effect monopolies that are regulated by Ofgem. Ofgem evaluates what their costs, including the cost of capital to finance investments, might be over an eight-year “price control” period. Citizens Advice claims many of the regulator’s calculations for the most recent price control went “considerably in networks’ financial favour”. It believes assumptions Ofgem made about factors such as the future path of interest rates and returns on government bonds were too generous, as was the regulator’s assessment of the risk associated with operating a network company. These “generous” assumptions will lead to network companies making average profit margins of 19 per cent and an average return of 10 per cent for their investors at the expense of consumers, Citizens Advice claims in a report published on Wednesday, which recommends a shorter price control period to allow for more accurate forecasting. “Decisions made by Ofgem have allowed gas and electricity network companies to make sky-high profits that we’ve found are not justified by their performance,” said Gillian Guy, chief executive of Citizens Advice. Ofgem defended its regulatory regime, saying it helped to cut costs, improve reliability and customer satisfaction. “Ofgem has already cut costs to consumers by 6 per cent in the current price control and secured a rebate of over £4.5bn from network companies and is engaging with the industry to deliver further savings,” said Dermot Nolan, chief executive of the energy regulator. Mr Nolan insisted the next price controls would be “tougher for investors”. The current price controls for the gas and electricity transmission networks, plus gas distribution, run until 2021 and until 2023 for local electricity distribution networks. “While we don’t agree with its modelling and the figures it has produced, the Citizens Advice report raises some important issues about network regulation which will be addressed in the next control,” Mr Nolan said. The Energy Networks Association, a trade body, refuted the claims of Citizens Advice, insisting that costs had fallen by 17 per cent in real terms since privatisation. The current regulatory framework was established after a public consultation, it said, adding that today’s report repeated several old claims that had previously been rejected by the Competition and Markets Authority. “Our energy networks are among the most reliable and lowest cost in the world and their performance has never been better. In the next six years energy network companies are forecasted to deliver £45bn of investment in the UK economy,” a spokesman for the networks association added. National Grid said that since 2013 it had generated savings of £460m for bill payers. “National Grid makes up just 3-5 per cent of the average bill, which pays for the transmission networks that transport energy across the country and our ability to balance the system second-by second. But even though it is only a small proportion we are always looking for new ways to reduce costs further,” it said. Theresa May is expected to forge ahead with an energy price cap this week despite misgivings among Tory ranks and warnings it could prove a “political and consumer timebomb”. If the prime minister opts for the wide-ranging intervention promised during the election – which she said would save 17m households up to £100 on bills – such a measure would require primary legislation and feature in the Queen’s speech on Wednesday. Cabinet ministers have told May to drop the proposal, according to a report last week, but it is understood some form of restriction on bills will be introduced. However, there is a possibility that the government will bow to pressure from ministers by introducing a watered-down “relative” cap. A relative price cap would see the most expensive deals from a supplier pegged at no more than a certain percentage above the cheapest tariff offered by that company. Opposition to a cap has also emerged from outside Westminster. One leading price comparison website on Monday called the plans a “political and consumer timebomb”. uSwitch, which relies on competition and people switching energy deals, said a ceiling would hurt rather than help consumers. “Competition will be diminished and cheaper deals would be taken off the market as tariffs moved closer to the cap,” said Richard Neudegg, the site’s head of regulation. He echoed previous warnings by the big six suppliers that because energy regulator Ofgem would eventually have to increase the cap in order to reflect rising wholesale prices, blame would shift from energy firms to ministers. Pro-cap Conservatives are likely to get further ammunition within the next fortnight, when British Gas is expected to hike prices for the three-quarters of its 14 million customers. The UK’s biggest energy company was the only one of the big six suppliers not to raise prices last winter, freezing them until August. But it has to give customers 30 days’ notice of any increase, and is understood to be battling rising wholesale costs. One of the firm’s rivals, E.ON, last week launched a new tariff designed to tempt people off default energy tariffs. The “cap and track” deal is fixed for 12 months at £100 below the market average when customers sign up. While it cannot increase during the contract, it will be reviewed each quarter and will fall if the wholesale price has fallen. “This is one of the many ways we’re helping to boost engagement in the energy market, particularly with people on standard variable tariffs,” said Chris Lovatt, the company’s director of residential operations. uSwitch said that in lieu of a cap, the government should work with suppliers and consumer groups to ensure billpayers get clearer information on how and why they should switch. The charity Citizens Advice reiterated its call for a cap to help more vulnerable customers, highlighting figures that show about 70% of the highest earners are on the cheapest energy deals, versus 12% on the lowest incomes. Although industry figures show 440,000 people switched supplier in May – up 19% on May 2016 – nearly 5m households in England have not switched supplier for a decade. Citizens Advice favours widening an existing cap for the 4m households on prepayment meters to a further 2.6m who are eligible for the warm home discount, a government scheme to help people struggling with their energy bills. “The choice does not need to be between capping costs for all or for none – there is a real opportunity to protect the most vulnerable who are struggling to pay their energy bills. The momentum to make this happen must not be lost,” said Victoria MacGregor, Citizens Advice’s director of energy, in a blogpost. The charity also called on the government to set annual targets for suppliers to get their customers off standard variable tariffs, which are used by more than two-thirds of people. Thousands of UK households face energy bill hikes of almost £200 on average as gas and electricity providers roll customers onto standard variable tariffs. A total of 54 fixed-rate energy deals are set to expire before the end of August, according to research by price comparison site Money Supermarket. This means thousands of customers are in danger of being rolled on to more expensive tariffs just as the colder weather begins to kick in. There are 19 tariffs ending in June, 16 in July and a further 18 in August from the likes of EDF, British Gas, Scottish Power, Npower and smaller suppliers such as GnERGY and Affect Energy. Bills have already risen in the past year, with all of the major suppliers announcing price increases. UK Conservative leader and Prime Minister Theresa May set out her party’s General Election manifesto on Thursday and it expressed a strong backing for shale gas and electric vehicles. Meanwhile representatives from the nuclear power industry have told Power Engineering International they believe the manifesto is positive towards their sector despite not being mentioned in the document. The party aims to have the lowest energy prices in Europe and has plans in place to make shale gas more palatable to affected communities. Planning processes for shale developments would be streamlined and a higher share of tax revenues, paid into a national “shale wealth fund”, would be given to local communities in a bid to overcome grassroots opposition to fracking. The Conservative manifesto claimed that Britain had the potential to have a similar ‘shale revolution’ as being experienced in the US, a technological development fiercely opposed by the Labour and Liberal Democrat opposition parties. The party also promises an independent review into the cost of energy to ensure UK energy costs are as low as possible, while ensuring a reliable supply and meeting 2050 carbon reduction objective. SPONSORED CONTENT BY Sulzer Management AG ? Despite the focus on affordability, the manifesto called for Britain to remain “at the forefront of action against global climate change” and reiterated a commitment to cutting greenhouse gas emissions by at least 80 per cent from 1990 levels by 2050. A goal for “almost every car and van to be zero emission by 2050” was renewed, together with a pledge to invest £600m by 2020 to help develop electric vehicles. The manifesto expressed support for the UK’s role as a “global leader in offshore wind”, while continuing to demonstrate opposition to onshore wind. In line with the principle of affordability, the manifesto omitted mention of nuclear power and said only that the UK’s post-Brexit energy policy would be based “not on the way energy is generated but on the ends we desire — reliable and affordable energy”. Nuclear power has come in for criticism due to its association with high costs. This represents a shift away from technology specific targets such as the EU goal for 15 per cent of overall energy to come from renewables by 2020. Among the other elements to the Tory party’s proposals were to establish an industrial energy efficiency scheme to help large companies install measures to cut their energy use and their bills. It was also proposed that smart meters be offered to every household and business by the end of 2020. Bodies such as Greenpeace as well as particular media outlets have pointed to the omission of nuclear power in the Conservative’s document as indicative of a negative attitude by the party to the sector, however nuclear interests appear unperturbed.